« Check us out at NAMM! 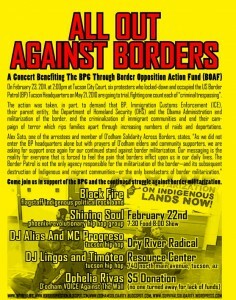 A Concert Supporting the Struggle Against Border Militarization. On February 23, at 2pm at Tucson City Court, six protestors who locked-down and occupied the US Border Patrol (BP) Tucson Headquarters no May 21, 2010 are going to trial. Alex Soto, one of the arrestees and member of O’odham Solidarity Across Borders states, “As we did not enter the BP headquarters alone but with prayers of O’odham elders and community supporters, we are asking for support once again for our continued stand against border militarization. Our messaging is the reality for everyone that is forced to feel the pain that borders inflict upon us in our daily lives. The Border Patrol is not the only agency responsible for the militarization of the border – and it’s subsequent destruction of Indigenous and migrant communities – or the only benefactors of border militarization.” Soto states. I’m happy to see you are well. I see you and your family as the voice and face of many, elders and youth alike, speaking and carrying yourselves in a sacred manner, as spiritual warriors for many who are unable to carry voice to these important messages. I’ve mentioned you to the grandfathers in sweat lodge on the Omaha reservation and miss seeing my many friends and fellowship in Flagstaff. I’m working in the artic circle now, and will continue to remember you here too, in this spiritual place, where similar political and economic battles are being waged against the people. Stay strong, body, mind and spirit. AHO. Really like your sound and messages, keep up the good work. Peace from Farmington/Durango.